All three lanes of traffic on I-495 southbound in Andover, Mass. were shutdown on Thursday afternoon after a tractor-trailer rollover. Police are at the scene of a tractor-trailer rollover on Interstate 495 in Andover, Massachusetts. 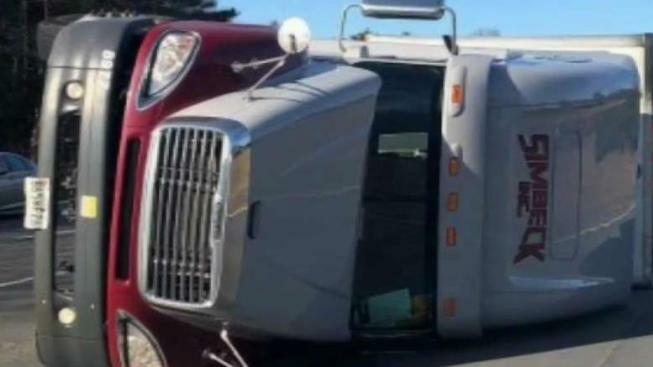 Rescuers responded to I-495 southbound near the Interstate 93 interchange around 5:10 p.m., where a truck had flipped on its side, blocking the road. The driver of the truck, who sustained injuries not believed to be life-threatening, was removed from the vehicle and transported to Lawrence General Hospital. All three lanes on I-495 south were closed as crews worked to remove the truck, causing massive delays.